We’ve all heard it: travel is good for the soul! Having traveled several times both domestically within the US and internationally, I agree. The opportunity to expose yourself to new places, people, foods, and cultures is an enriching experience. However, as romantic as travel can be portrayed, it’s also incredibly stressful to plan and execute a successful trip without the proper knowledge. If you’re anything like me, you’ve made it a duty to start finding more opportunities to travel moving forward. I’m dropping my 8 essential tips for traveling in this blog post! Plus, there’s a free gift somewhere in this post as well – be on the lookout! Do you all know about cookies? Nope, not the yummy kind with chocolate chips or oatmeal raisins. Cookies are tiny files stored on your computer that are accessible to internet clients. You know when you’re on Fashion Nova looking at some cute clothes, and the same dress pops up on Facebook ads? Cookies are the culprit! Saving you all the technical jargon, it basically allows hotel and flight sites to know what deals you’re looking at. That’s why sometimes, when you’re looking at flight and hotel deals and you revisit the website later, the price has gone up. Nope, it’s not because the tickets and reservations are selling like hotcakes. That’s what they want you to think, so you’ll make an effort to buy it before the price “raises” again. Save yourself from the antics and browse in incognito mode. I can’t stress this enough! It will save you so much time when you’re getting ready to start your day. I always pack about 2 outfits per day I’ll be gone – especially when I’m visiting the beach. The worst thing is when you have an outfit planned in your head, but it looks awful when you actually put it on. Before I leave on vacations, I plan outfits by trying them on. Then, I snap a quick picture on my iPhone. Boom! Your own personal outfit gallery! Use it to select your daily looks while on vacation. Maybe I’m a weirdo, but I hate taking extra time after flights to grab my suitcases off the carousel. It’s even more of a hassle during international travel when you have to grab your bags and RECHECK them just because you’re switching continents. I bought a hard-shell rolling carry-on and never, ever looked back. 10 day trip to Cuba? Squeezed everything into a carry on. 3 day trip to Miami? Carry on. Most airlines let you have both a “personal item” that fits underneath the seat in front of you along with a carry-on suitcase that has to fit in the overhead bins. I usually use the rolling suitcase and a small backpack. This is also a money saver because the cheapest airline tickets don’t include a checked bag. Finding points of interest for travel has never been easier, but it can be overwhelming to start. My recommendation is always to start with Pinterest and Instagram. Pinterest has so many different bloggers who will document their travels to specific locations. These travelers are awesome at finding not just the touristy locations, but also places where the locals frequent and love. Also, Instagram is a little-known, yet perfect way to find places to eat and go. Just a simple search on Instagram with the hashtag #ChicagoFoodies will turn up so many photos of amazing places for food. A search for #LAFun turns up awesome places to go in Los Angeles. Make use of hashtags, and don’t be afraid to message some residents of that area about hidden gems to visit! Someone might surprise you. Have you ever went on a trip and forgot something? For me, it’s been a toothbrush more than once. Instead of pausing the trip to get something you left at home, make sure to pack effectively the first time around. Using a packing list seems old school, but it’s a life saver. 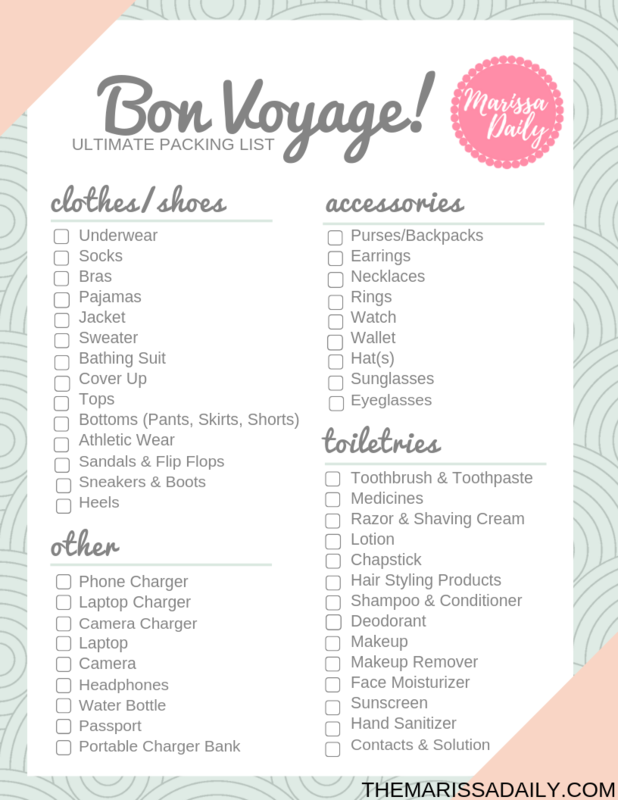 I’ve created a free download with the ultimate packing list for your next trip! Even if you don’t use it while packing, read over it afterward just to be sure you’re prepared. You’re welcome! To easily pack in a carry on, this is my #1 tip. Plus, rolling clothing helps to keep pesky creases that come from folding clothes. You can fit so much more in a suitcase if you roll your clothing instead of folding it! Go ahead, try it. Don’t get me wrong, I understand that some believe moments are only truly experienced without cell phones. However, I’m a very sentimental person. Taking photos and videos enhances the experience for me because I can look back later. As amazing as my trips have been, I don’t remember every single one of them in vivid detail. Take photos, get the perfect shot for memory lane, then enjoy the moment! Last, but certainly not least! Notify your credit card company when you’re leaving. Most companies allow you to do this online if you’re like me and prefer not to deal with trying to reach a real person on the phone lines. I’ll tell you from experience, it’s not fun having your credit card declined. This happened to me in Miami, and the bartender was super sweet and reminded me that if I was on spring break, it’s probably my bank blocking funds. She was indeed correct. I hope you’ve found some useful tips! What are your dream places to see!? Previous postI Attend Grad School Tuition Free. Here’s How. Love this blog. It’s very informative! I amazed how you were able to pack things in one carryon for 10 days. Also, the way you snap photos of your outfits to help with getting dressed while traveling.